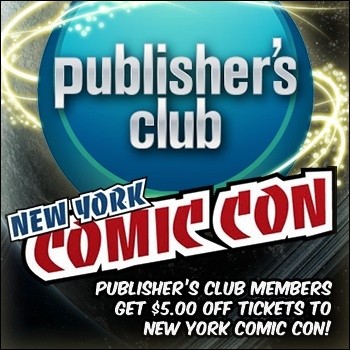 Publisher's Club members receive $5.00 off tickets for New York Comic Con! Dust off your Wolverine, Ash Ketchum and Joker costumes, because Publisher's Club members now receive $5 off New York Comic Con Tickets! New York Comic Con is the East Coast's biggest popular culture convention with over 77,000 attendees in 2009. Their show floor plays host to the latest and greatest in comics, graphic novels, anime, manga, video games, toys, movies, and television, and this year will feature appearances by John Romita, Sr., John Romita Jr., Stan Lee and Katee Sackhoff (just to name a few!). The convention will take place in New York City, October 8-10, 2010, at the Jacob K. Javits Center and The Escapist will have a booth for you to stop by and hang out! Click here to learn more about New York Comic Con. If you are already part of The Escapist's Publisher's Club, you can find further details on how to claim your discount by going to your Profile and then click on "Subscription and Benefits" under the Profile Options. To learn more about what you can expect from becoming part of the Publisher's Club, including all of the benefits, please click here.